With the book thing being the lazy hound way to blog, I thought I’d just throw this little book jacket illustration up because I like it. 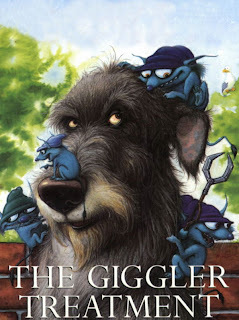 The hound of Roddy Doyle’s, Giggler Treatment tale may not be a deerhound, nor a wolfhound, but there are definite celtic influences going into this little illustration, as well as the story. A shaggy coated grey hound and a gaggle of the blue fairy folk . . . hmm . . . I wonder? Right now, I’m ploddin’ about in the highlands and believe it or not it’s sunny. Camera in paw, I will bring you some new movie adventures soon. Anyone interested in a deerhound day out this Sunday, 5th of August, The Scottish Pedigree Whippet Racing Club Fun Day will be taking place at Ochtertyre Road, near Stirling, Scotland. As usual you’ll find we deerhounds at the chase, so if you are a deerhound, why not come along and join the rest of us? Thanks to Sid and all oor pals at Lyart for reminding us of this event. We’ll be there. This book has been published for quite some time now but is well worth a nod in the direction of. Especially if you are a deerhound, deerhound fan, or simply interested in the Men & Beasts of lowland Scotland. First allow me to reproduce the cover copy as an insight into this wonderful little publication . . .
Come and meet some wild men and tame beasts. Explore the fleeting moment and capture the passing of time in these portrait studies which document a year's journey. Travel across Scotland with poet Valerie Gillies and photographer Rebecca Marr: share their passion for a land where wild men can sometimes be tamed and tame beasts can get really wild. Among the wild men they find are a gunner in Edinburgh Castle, a Highland shepherd, a ferryman on the River Almond, an eel fisher on Loch Ness, a Borders fencer, and a beekeeper on a Lowland estate. The beasts portrayed in their own settings include Clydesdale foals, Scottish deerhounds, Highland cattle, blackface sheep, falcons, lurchers, bees, pigs, cashmere goats, hens, cockerels, tame swans and transgenic lambs. 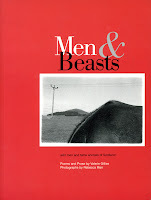 Photograph, poem and reportage - a unique take on Scotland today. 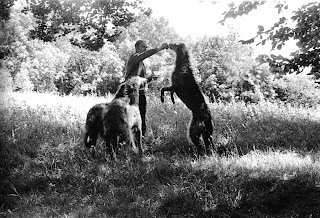 I have included here, a couple of the atmospheric photographs from Men & Beasts, featuring Hounds from Hilda Robertsons’ Tartraven kennel, one hound being the Dam to ‘Tynum’ a family deerhound who once resided at my home back in the time of legend. The book has some interesting ‘Celtic/Scot/Pict’ deerhound histories and references that are culled from archaelogical excavations, Gaelic folklore, literature and poetic verse. The mention of the hound statue dating from 3rd Century AD, discovered at the shrine to Celtic healing-god Nodens sounds interesting (even though the Irish Wolfhounds claim it to be theirs). It’s more evidence carrying our hound ‘types’ existence, back through time and along the parallel history timeline to that of man. 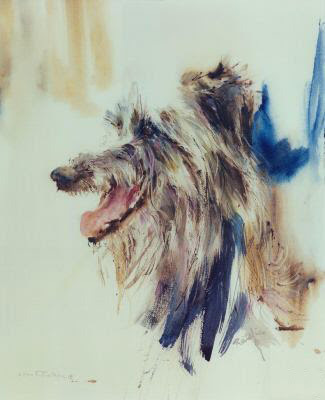 Talking of ancient time-lines, we know that the art of Poetry may infact be the oldest form of literature (I’m sure Gilgamesh in his adventures from the 3rd millennium BC probably even had his own hound companions) and with that Valerie Gillies both captures the culture specific and contemporary deerhounds in her works here. If you are interested in this printed works or other independent Scottish publishings, visit the Luath Press and rumage around and tell them Rogue the deerhound sent you. one by Meall an Fhiohdian. I have had a few e-mails and comments, enquiring after the music used throughout our deerhound videos on the blog, so I thought I’d point some of the deerhound owners out there in the direction of some of the more fun sources that every deerhound should have in there collection. The names may be vaguely familiar - but this is the real deal for all your Scottish highland hootenannies. 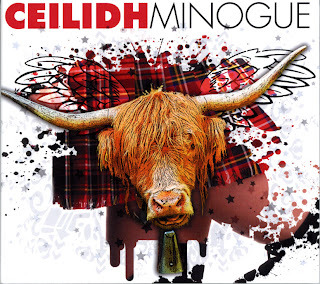 In no particular order of preference we have Ceilidh Minogue for a guid auld knees up, more than welcome at any Ceilidh - 12 tracks of blistering barn stormers. Click the artist name for a link. 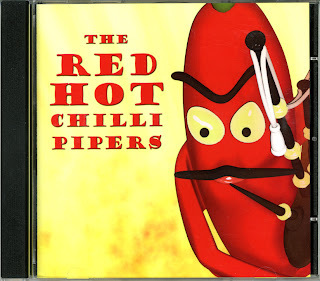 Next in the list is some skirling to get you whirling with The Red Hot Chilli Pipers, 10 tracksof chanter, banter for a shoogle of the kilt. 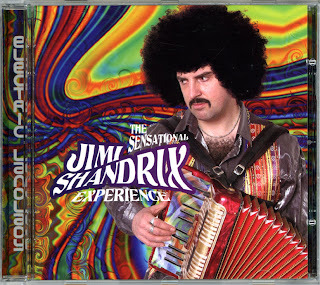 And last but not least in this collection, is The Sensational Jimi Shandrix Experience - featuring some great wheezing, squeezing, accordian playing by Sandy Brechin - who resides not to far from the Rogue and infact his father will be well familiar with deerhounds through his Veterinary trade and indeed has assisted with former family members. Check out the great Electric Landlady collection - 10 sporran shakin knees ups for a grand nicht oot - it was the Shandrix’ Virginia Reel that we featured in the Alva video. Scoorie doon tae the shops and purchase these essential tunes now, if you don’t already have them in your collection . . . a must! Enjoy. After spending some time editing this video earlier in the week, the houndputer decided to crash without saving my work - argh ! Well, back to the ‘begin again’ mode, and eventually getting there with what little footage we had captured from the Alva Dog Show on the 8th of July. As mentioned in the previous Alva post, the ‘Ochil Hills’ as the gateway to the Scottish Highlands, provide a magnificent backdrop and almost natural and ideal Deerhound show location. I will not include the further tales of hunting in these hills, collected from this show, for fear of a few of my deerhound friends and family being taken into custody (only joking) - but I must add thanks to the friends and their tales for an entertaining afternoon. A show ALL deerhounds should attend for a hearty feeling of home and an all round fun day - ENJOY! Happy Birthday Charlie - 80 years young today! 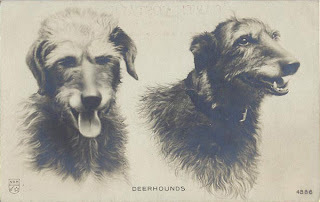 I thought I’d upload this little cigarette card of a DEERHOUND (?). 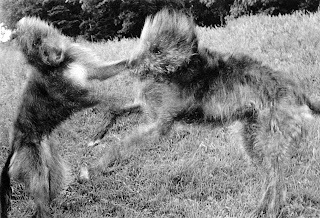 For both, enjoying pleasure from the existence of this card and having fun, for the simple reason, that my human companions (whom have enjoyed several dog shows,) now realise where some of the Judges have lifted reference for what they consider are good Deerhounds. Do not get me wrong, as a deerhound, there are no deerhounds I dislike. And likewise, I am aware that not all judges share breed standard tastes. But it would prove a lot more interesting if the judge were only to be permited to view the dog as a numbered entrant with a non descript handler and no knowledge of ownership or kennel source. That way it would be easier for us hounds to judge the human as fair in decision making or gage their guess work effort in identifying the hound, ha! ha! Dog shows . . . just another part in the colourful Deerhounds world. Anyway, enjoy the image below and use it as your judging guide or alternatively judge on your true feeling and be prepared to give your reasons for selection - especially when we are about, because we think it would be nice to publish the judges thoughts and reasons on this blog, so we hounds can reverse the judging roll and mark the judges on a best of show basis, perhaps even award them a RogueStar trophy. Hopefully this week we shall upload an Alva, Clackmannanshire Short Dog Show video. Featuring the fantastic Scottish mountain backdrop (the Ochil Hills), a magnificent location for a Scottish Deerhound show. Don’t know where Alva is? Click the wiki link. Way back on Wednesday, April 19, 2006 under the ‘That’s Us on that Label!’ blog, we highlighted where deerhounds with their obvious Scotch heritage are featured as part of a Whisky label for the ‘Highland Chief’ blend. With Scotland being the worlds leading exponent of whiskies here’s an interesting little Scottish deerhound ditty for all the deerhound family out there. 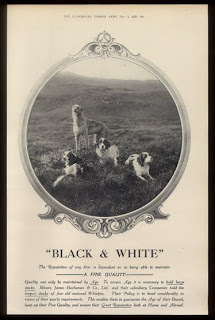 James Buchanan, a Scottish, London-based whisky blender and merchant was an ardent animal lover and in the 1890s, returning from a dog show, he conceived the idea for one of the world’s most famous trademarks. That trademark is the famous ‘Black & White’ from an export Scotch Whisky blend. Two little canine companions to we deerhounds were eventually selected for the permanent brand logo and label. 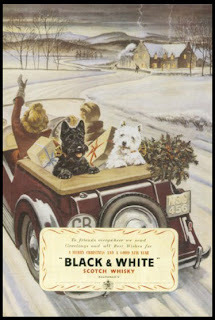 The black Scottish terrier and the West Highland white terrier were adopted as the brand’s motif which is still in use today. The whisky was the standard blend of the James Buchanan company which began in 1884 and the blend was originally known as ‘House of Commons’. The name arose after the company received a contract to supply the House of Commons with the whisky only one year after their conception. The firm was also one of the prime movers in the introduction of blended whiskies to the English market. The whisky was bottled and labelled in a very distinctive black and white livery and the popular nickname ‘Black & White’ eventually was adopted as the brand name. The customers simply asked for the black bottle with the white label - and after enjoying a few drams, this may go some way to explaining some of the behaviors, reasoning and political decisions made within the ‘House’ both then and now. After a series of mergers and acquisitions involving Dewar's, the Distillers Company, and Guinness (forming United Distillers), the ‘Black & White’ brand like so many brands changed ownership several times and is now owned by the organization Diageo. The blend is claimed to be most successful in France, Venezuela and Brazil. 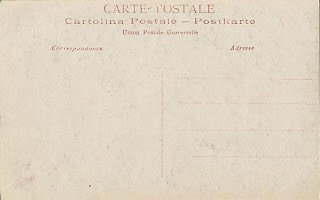 At present, the brand ‘Black & White’ is not used within the United Kingdom. What does it taste like: A clean, pleasant mild blend, Black & White has a fresh, grassy flavour, which is complemented by a light sweetness. 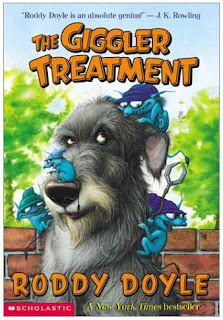 Sounds like the medication we hounds enjoy when lacking - you know the stuff . . . when we chew a mouthful of that sheep, horse or cattle feed better known as grass. 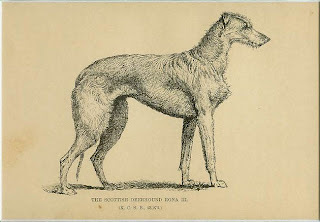 This all seems a little much non deerhound to be featured on my blog, but the interesting part involves a little closer look at the history. When James Buchanan first visited the dog shows he was attracted to the Scottish Deerhound, whether he owned one, I’m not sure. 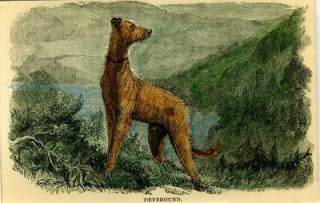 Evidence can be found of the Deerhounds consideration in early printed adverts from the late 19th century which featured dogs as part of the marketing campaign. 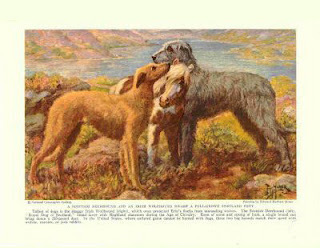 The oldest example can be seen here with the deerhound clearly visible, also a more recent marketing example is shown featuring hounds plus two examples with our two little highland tearaways. The evolution from the mountains to open top sports car reflects both the whisky and canine’s historical journey. But give me the Highland Glens anytime. Little ‘Black & White’ snippets from around the web . . .
‘Westies’ - The show development of the Westie lagged somewhat behind its development as a ground hunter. In England, the first dog show having a classification for terriers was held in Birmingham City UK in 1860. The first Scottish show that included the terriers was held in 1871 in Glasgow. In 1899, at the Crystal Palace, a white Scottish Terrier was among the winners. The first show where West Highland White Terriers were classified separately was in 1904 at the Scottish Kennel Club Show at Edinburgh. The West Highland White Terrier Club of America was formed and admitted to the AKC in 1909. 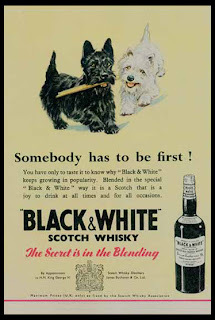 ‘Scotties’ - The Scottish or Aberdeen terrier or "Scotty" has inspired more design and decoration than any other breed (hmm, deerhounds to your posts, we may have to contest this) The most famous appearance is as one half, along with a West Highland White, advertising ‘Black & White’ whisky. In some European countries both breeds are known as ‘Whisky dogs’. 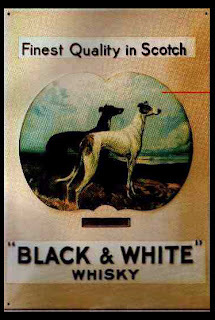 Perhaps it is just as well we deerhounds did not end up on the label - even if, when you do mix ‘Black & White’ you get our grey. It’s been a wee while since posting to the blog almost since this image appeared in a 1937 edition of National Geographic magazine. I have so much deerhound catching up to do . . .